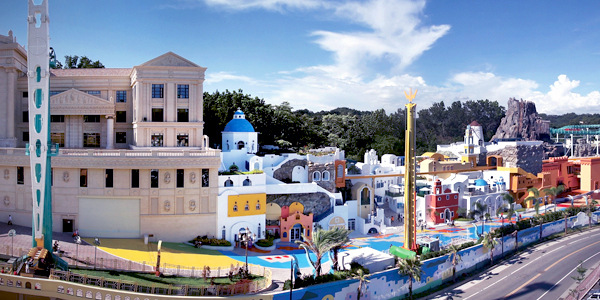 E-DA Theme Park is the only Greek Aegean Sea style theme park in all of Taiwan. It also has the most attractions, including “Upside Down” an outdoor roller coaster reaching 55 meters, “Flying Over Love Sea” a ride reaching 33 meters, and “Extreme Limit Challenge” the only ride in Asia fashioned after a skateboard half-pipe. These rides allow you to experience all the sharp turns, drops, and excitement you desire. Is built based on the ancient Greek sanctuary and houses the E-DA Royal Theater. The Royal Theater is the only theater in Taiwan that is modeled after large scale international theatres. There are over 1800 premium audience seats that give the theatre a high class feel. During the day shows are organized for tourist groups, while at night tickets are sold to individuals who wish to see the international performances. The beautiful Santorini Mountain City, completely copying the Greek islands’ blue and white scenery, produces the romantic atmosphere of an Aegean Sea Village. Within the beautiful sky castle, you can thoroughly enjoy a Greek Style Feast while relaxing and taking in the beautiful scenes that are sure you bring you joy. Go back in time to the historical scene of Troy, Taiwan’s largest family indoor amusement park which is measured at nearly 50,000 square feet. Where you needn’t worry about the weather condition. In this area you’ll find the Halloween House, “Dark room roller coaster”, and as well as the only flight simulator in Taiwan that lets you fly throughout the country. We are sure all of these facilities can meet your family’s needs for fun and excitement. At 230 meters above sea level, E-DA’s Ferris Wheel is the tallest in all of Taiwan. Equipped with comfort air-conditioned carts, a diverse light show, and providing sweeping views of the beautiful scenery of Kaohsiung and Pin-Don, the E-DA Ferris Wheel can provide the happiness atmosphere for any occasion.